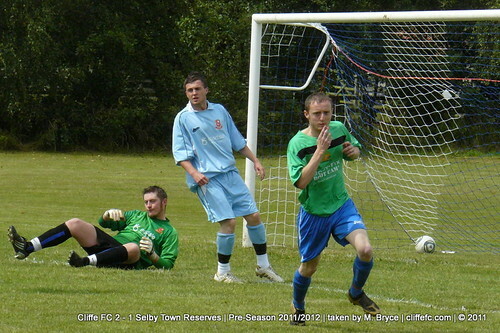 Cliffe Football Club began pre-season friendlies with a 2-1 win over a competitive Selby Town Reserves side. Keith Tiplady fielded a total of 18 players in total during the match using a mixture of last season’s squad and a few playing their first game in Cliffe colours. Cliffe FC sporting a unique combination of green shirts, blue shorts. 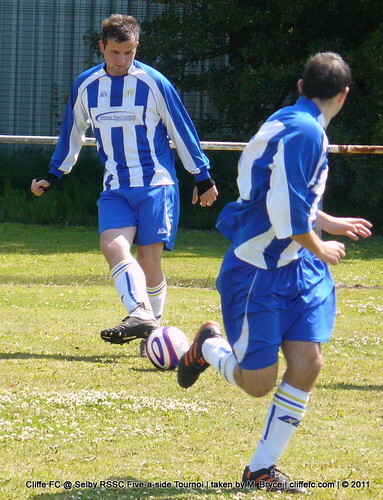 – A reverse of the kit worn back in pre-season 2009 at Goole Goods Office. 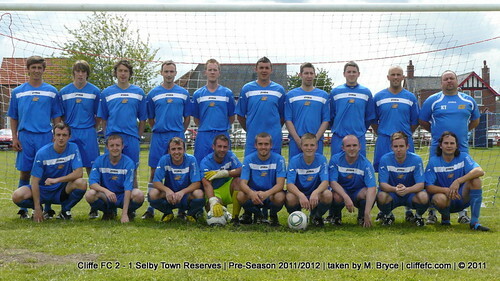 Cliffe started cold and Selby Town had the first chance, Ally Harris having to tip the first shot of the game round the post. With their first chance, the home side opened scoring when Shane Cawkill neatly passed the ball into the net for 1-0 to Cliffe inside the opening minutes. Aaron Lees earned a penalty before the break but hit the woodwork leaving the score at 1-0 before the break. Keith Tiplady introduced almost a whole new team via substitutions at the interval and shuffled the pack again throughout the second half using rolling subs. A goal-line scramble towards the end of the match saw Andy Addison bundle the ball into the net for 2-0, the referee marking the goal as an OG, before Town grabbed a goal in the dying moments. 2-1 final score. Cliffe FC’s next friendly is Wednesday, August 3rd when they welcome Copmanthorpe to Oxen Lane before the first round of the Selby Cup on Saturday, August 6th. Cliffe FC’s five-a-side team competed in Selby Railway’s mini football tournament and thier great effort saw them bow out to eventual champions in the semi-final.